One of Anchor’s most pro-active care homes hosted a ‘Bring Your Child To Work day’ yesterday. Palmersdene care home in Jarrow, Tyne and Wear had six children at the location on Wednesday 25 July. Home Manager Maureen McCullough explained how the idea came about. "We were discussing child minding issues amongst the staff and one of the younger mums said why don’t we bring our kids to work one day. Mine are always asking me about my work and what we do for older people, now is our chance to show them. "It coincided with the start of the summer holidays so was perfect timing to host it this week. We let the residents know in advance, just to warn them, but in every case they were really looking forward to it, and I’m delighted to say everyone enjoyed it. In fact most of the residents asked when can we do this again!" The home also has one of eight candidates short-listed for Anchor Chef of the Year, so Ian the Chef was tasked with making enough treats to keep all the kids happy. 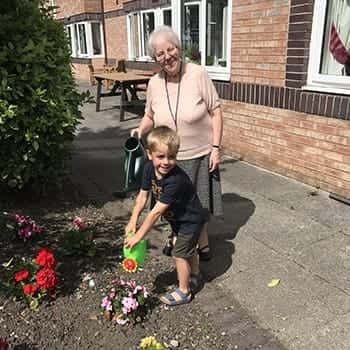 Photo shows Billy Godwin, Maureen’s grandson helping resident Eleanor Barlow water the flowers at Palmersdene.